FertilAid for Women is Actually Two Products in One! Most women are well aware that they should be taking a prenatal vitamin while trying to conceive. While FertilAid does contain all the ingredients of a prenatal vitamin (including folic acid), at the precise levels recommended for trying-to-conceive women, this is only one aspect of FertilAid. 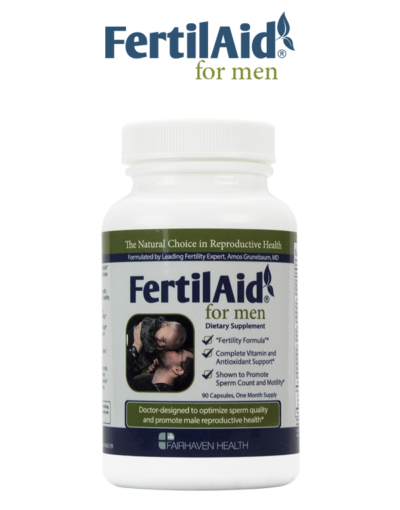 In addition to serving as your complete prenatal vitamin, FertilAid is also an herbal fertility enhancing supplement. It contains a proprietary blend of key fertility promoting nutrients, including red clover, PABA, Siberian ginseng, vitex agnus castus, and ginkgo biloba. This formula was designed by Dr. Grunebaum to encourage hormonal balance, regular ovulation, and overall reproductive health. 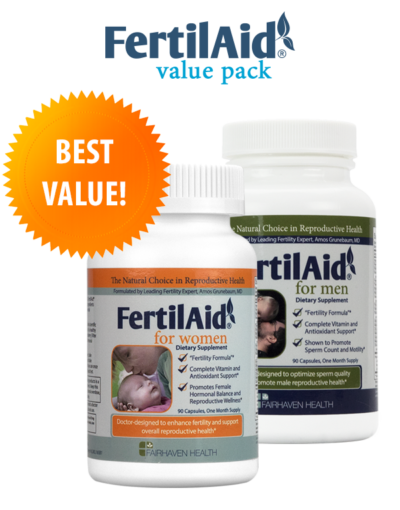 With FertilAid for Women, you can rest assured that you are getting full preconception vitamin support while you are trying to conceive. Once you become pregnant, we recommend switching to a regular prenatal vitamin, such as PeaPod Prenatal. 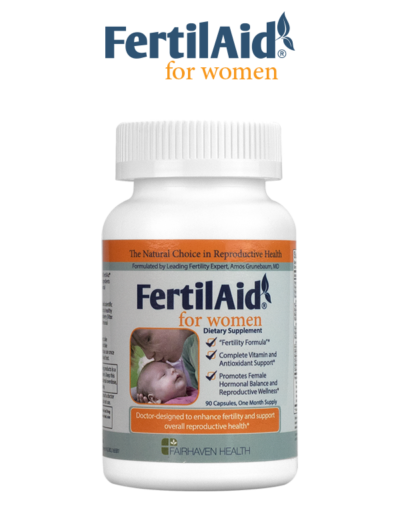 How do the ingredients in FertilAid’s proprietary blend benefit your reproductive health? Red Clover Blossom: Red Clover Blossom plays an important role in helping to encourage optimal hormonal balance and may help to boost estrogen production in estrogen-deficient women. Vitex Agnus Castus (Chasteberry): Vitex Agnus Castus, or Chasteberry, as it’s often referred to, is a key ingredient in FertilAid. Vitex has been shown to encourage cycle regularity, promote ovulation, and improve reproductive rates. It may help address progesterone deficiencies, and may be beneficial for women with a short luteal phase or luteal phase defect. PABA: A B-complex vitamin, PABA has been clinically demonstrated to improve reproductive rates in infertile women. Siberian Ginseng: A staple of Chinese medicine, Siberian Ginseng may help promote hormonal balance, while supporting healthy uterine function. Ginkgo Biloba: Ginkgo Biloba is instrumental in encouraging healthy blood flow to the reproductive organs. It is likely a contributing factor to the increase in libido noted by many FertilAid users. To learn more about the individual herbal fertility enhancing ingredients in FertilAid, click here.